I just learned that my friends Steve (from Mormon Wookiee) & Diane--the ones who wrote this post on infertility-- are starting the adoption process!! I like this photo of Diane that I snagged off of their new adoption blog called "Together's Better," because it just melts my heart. 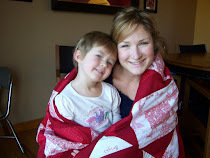 What child wouldn't want to snuggle with this sweet mama and her cute little comrade? I've realized recently that I've not only become an advocate of Motherhood and of family during my time as a young mother...but I've become an advocate of Childhood. Prior to becoming a mother, I never fully stopped to ponder just HOW special those years are, how irreplaceable they are and how fundamental they are to shaping a person. Recent events, however, have sealed that conviction in my mind that we adults are responsible, especially us Mothers, to be the guardians of children and of Childhood in a world that does not always do that. Anyway, when I look at Steve & Diane and other couples out there like them who are looking to adopt, I don't just see people who want to be parents, but people who want to love and protect children and Childhood. So if you know anyone who is considering placing a baby for adoption, please send them to Steve and Diane at http://togethersbetter.blogspot.com/! Merry, merry everybody! Jocelyn, thank you so much for posting this! Diane and I are both so grateful to count you as a friend. Oh that is so awesome! My husband and I are licensed and waiting through the county right now for a foster/adoption of one or two little ones. I will definitely go follow your friend's blog. Children are such a blessing and we hope that your friends are blessed very soon! Thanks for sharing these thoughts; I am not aware of anyone right now, but I will keep my eyes open on this one. My last little grandson was adopted by my son. They were foster parents and were able to adopt him. He looks just like the other children; it is amazing. I hope they find a baby soon. My daughter is trying IVF next month, but adoption may be in her future, too.